Once I’d made it to 1m I filled in the chevrons (see this tutorial), and the search for a border began. I found the perfect one, the wave stitch (often known as reverse shells too). 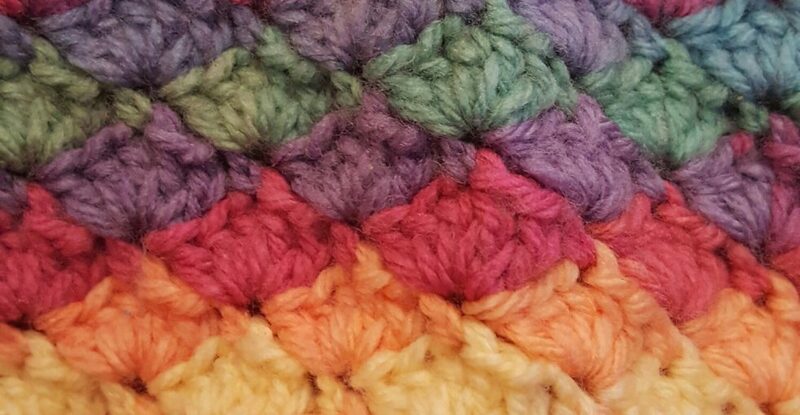 I had a couple of false starts as using treble crochets it was too tall so I swapped to half trebles with doubles at the base, then the blanket began to ripple so I frogged a whole side and started again, leaving one stitch between each pattern repeat to spread them out more (this worked a treat!) It took a few hours to complete as it was quite intricate, but I think it looks like fluffy clouds around the rainbow chevrons. Have you finished anything this week? How long had you been working on it for? Please share! That is so darn pretty! Maybe I would be better at ‘trochet’ than I am a crochet?! You never know! ( I don’t know the difference though!) Thanks, I love the pretty colours, hoping it lasts her a while. You will have to keep it even when she outgrows it. It is a smashing FO! I love it! And of course, hooray! I like the border you chose for it, it’s perfect for the project. That is so pretty. I love the border also. Perfect choice. I have been working on some cards as I volunteered to help with a group of 7th grade girls for a craft. I am slowly getting them figured out. i love how your choice in edging! these colors are cheerful and exuberant i’m ready for spring! The colours in your blanket are just gorgeous. I love the border. I might have to try that one on my next blanket. What a great blanket! How cute is your daughter? I’m sure she will keep it for a long time. I know what you mean about not making another blanket in single crochet! I actually tried starting a baby blanket a couple months back in the same pattern and after about 15 rows I ripped it back due to the monotonous repetition of the sc’s! Not to mention it would have taken forever to complete. I do love the colors you choose and the border is perfect with that pattern! Glad you stuck with it and finished it! Thank you! I’m making a baby blanket later in the year and will 100% be avoiding this, even if it is pretty. my favorite so far!! the colors are too sweet and that trim is precious! All I can say is Wow! Good luck, I’m sure you will finish it! The blanket was getting a bit big for a car project. I’m still looking for my one. Its so satisfying to finish a project you have been working on for a while! This week i finally finished a dino scoodie that had been forgotten about! I started it around 2 years ago! Thank you, I love the wave stitch and will hopefully have a chance to use it again one day. Your cross stitch projects are fab, I can’t believe how quick you are! Thank you, but the letters are pretty quick stitches. Way smaller than what I usually do. It has been a nice change of pace to finish something so quickly. I am itching to pick up my crochet hook or knitting needles, though. Your crochet is so perfect. Mine, not so much, but I do like that it goes quicker than knitting. 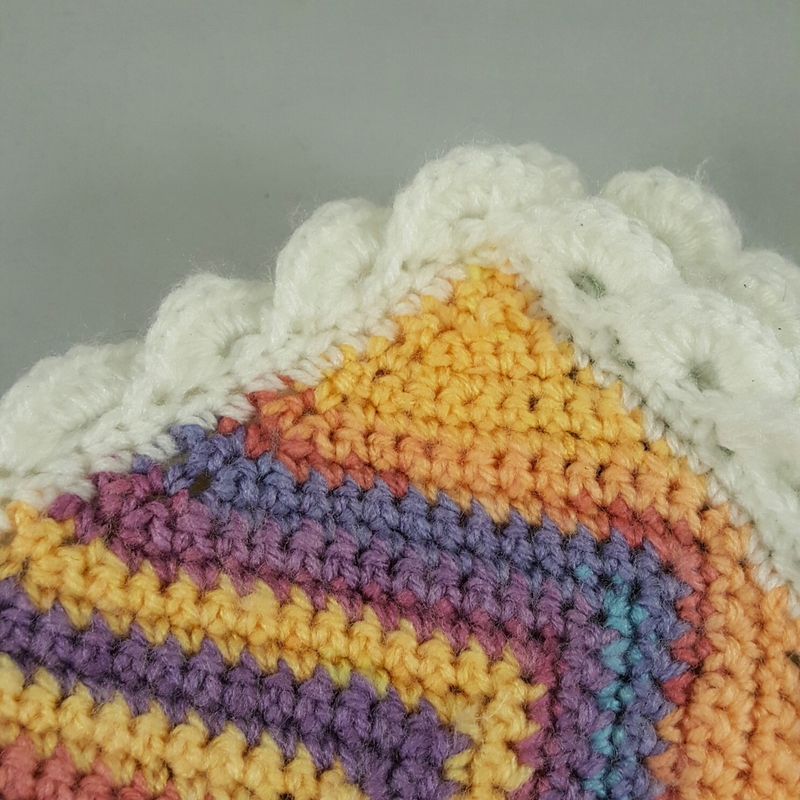 Thank you, mistakes are easily hidden in crochet (at least in the patterns I choose!) It’s nice to be able to choose between knitting and crochet, and I agree, crochet works up far more quickly. Mayn this is amazing!! 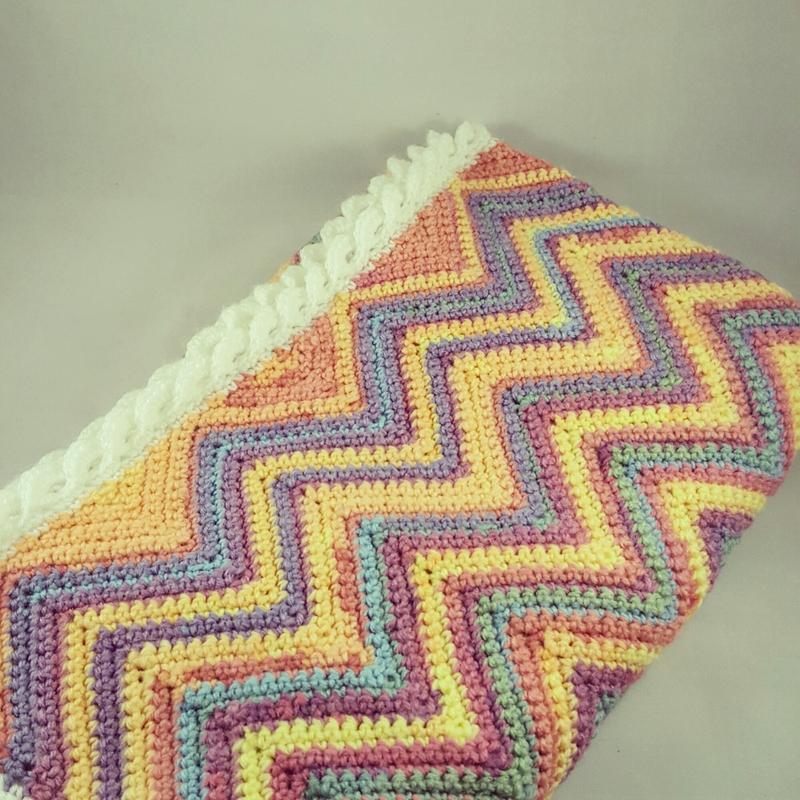 I once tried crocheted a Chevron pouch. But this is more lovely! This is lovely , impressive edging , am sure your daughter will be snuggling in this for years to come. Looking forward to seeing the next car project ! I love how the colors work together. Very pretty! Thank you, they were not my favourite to work with but it’s a very popular blanket here! This is just beautiful! I love the clouds! This is great! I’m working on this pattern at the moment too! Thanks, it’s a lovely pattern, if a little time consuming.